Extracting maximum performance from the valve train is essential for best power, smoothness and longevity. 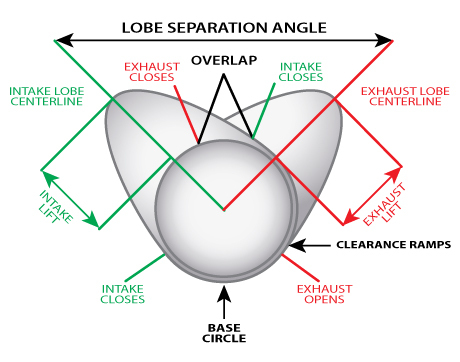 As an engine's valves open and close, the contact angle between the valve and the rocker arm becomes critical to proper valve operation and engine performance. Any side loading can decrease seating efficiency and reduce available horsepower. "Power-By-Victor"™ Black Edition V™ Engines are machined for minimum valve side loading at 50% opening of the valves for improved power, performance and reliability. The rocker-arm, which serves as a lever, must act thru an arc. To convert the maximum amount of the arc-motion of the rocker into the maximum amount of linear-motion at the valve, the mid-point of the linear travel must fall exactly upon the tangent of the arc. In setting-up the valve train's geometry the variables are the length of the push-rod, the length of the valve stem and the height of the pivot-point. To help achieve consistency, valve spring pressures and heights are matched for uniformity. Similarly, hydraulic lifters are matched for identical bleed down rates to assure uniformity of independent valve overlap timing and maximum throttle response. Valve clearances are also set to consistent "Power-By-Victor"™ specifications. The camshaft is precision-profiled or replaced for optimum performance, and the resulting profile is computer- tested with a "cam doctor" for proper velocity, acceleration, displacement and tapered to "Power-By-Victor"™ specifications for maximum engine life. Optimizing your valve train's geometry will improve the engine's Volumetric Efficiency which translates into more torque at low rpm and reduced fuel consumption for the same power output right across the RPM band. Proper valve train geometry also guarantees the system is absorbing the smallest amount of energy, which translates into reduced wear and better horsepower output.